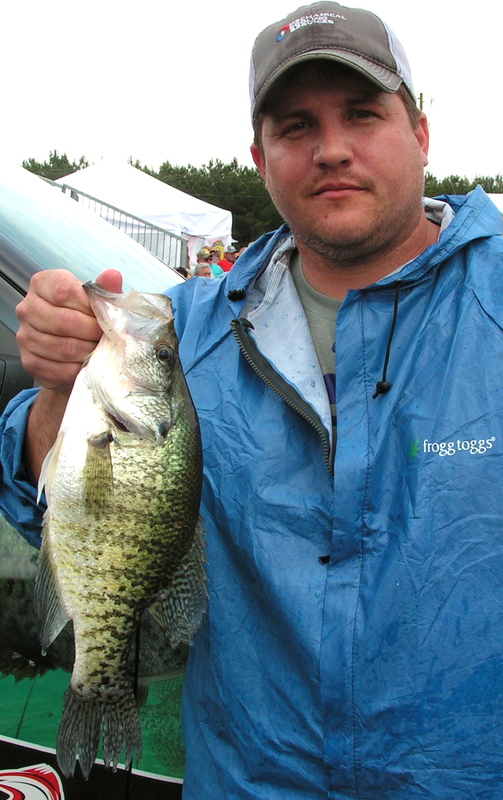 The first ever Crappie Masters tournament in Louisiana, sponsored by Lake Fork Trophy Lures, is in the livewell and Lake D’Arbonne, Lake Claiborne and Caney Lake are on the crappie map and crappie fishermen’s radar everywhere. Nearly 60 teams fished in the tournament and weighed in 407.55 pounds of fish from the area lakes. Each team would weigh only seven fish. A majority of the fish came from Lake D’Arbonne. The winning stringer came from Caney. The fact that local celebrities Jay Stone and John Godwin won just adds icing to the cake. They are regulars on area lakes and are fine crappie fishermen. 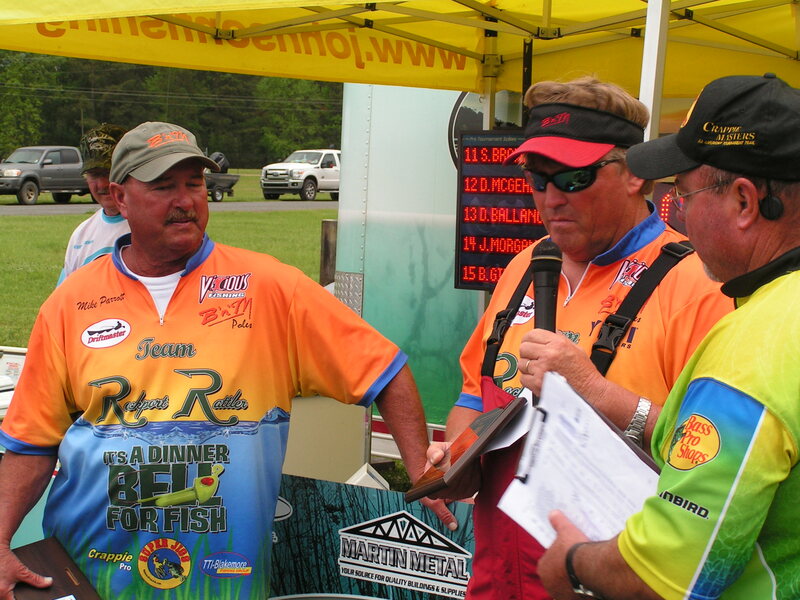 Their winning won’t do any harm to growing interest in Crappie Masters tournaments, either! 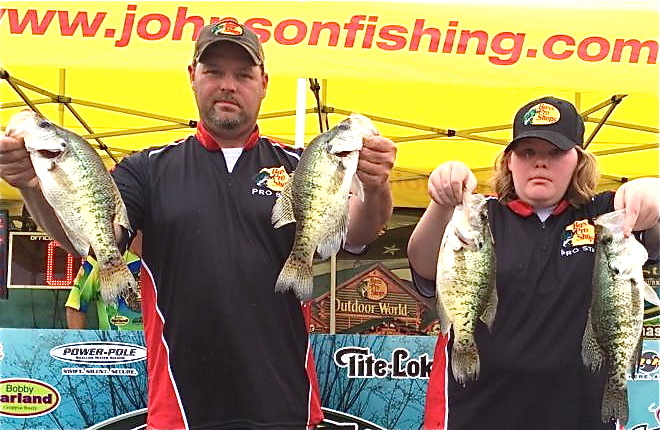 If you missed the details of their win, check the previous post here, “Stone, Godwin are Crappie Masters”. 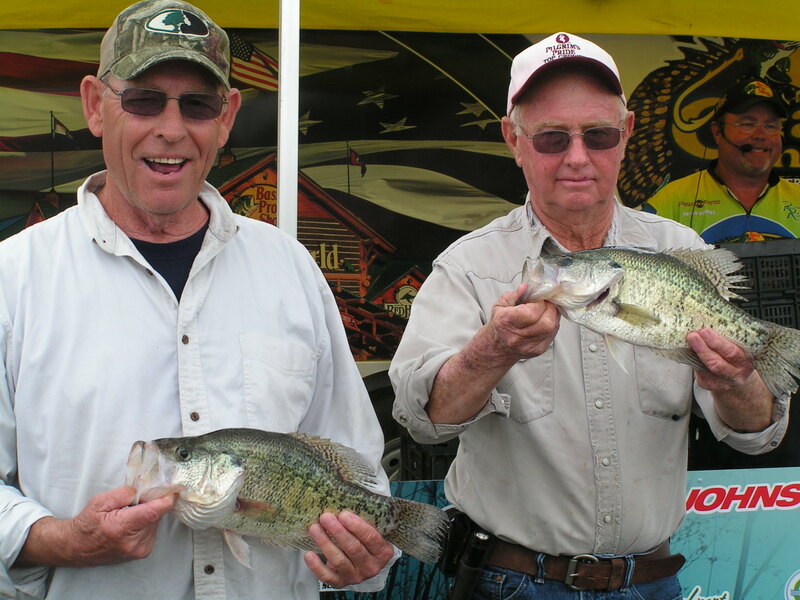 * Freddie Dooly and Dwaine Barthol of Texas won big crappie of the tournament with a 2.03 fish. Ironically, that was the only two pounder weighed in during the tournament. Had it been a couple of weeks earlier, dozens of twos would have hit the scales. * The runnerup team of Whitey Outlaw took a different approach to the tournament. They headed up D’Arbonne Creek and found fish in 2-6 feet of water away from the crowds. They didn’t fish around another boat all day long. They caught fish on minnows and various colored plastic trailers behind a pink headed Rockport Rattler jighead. They said they caught over 400 fish during the week on flats. The fish were tuckered out after the spawn, just hanging out away from structure. None of the fish they caught had eggs. The fishermen were tuckered out, too. They have a 700 mile drive home to North and South Carolina. 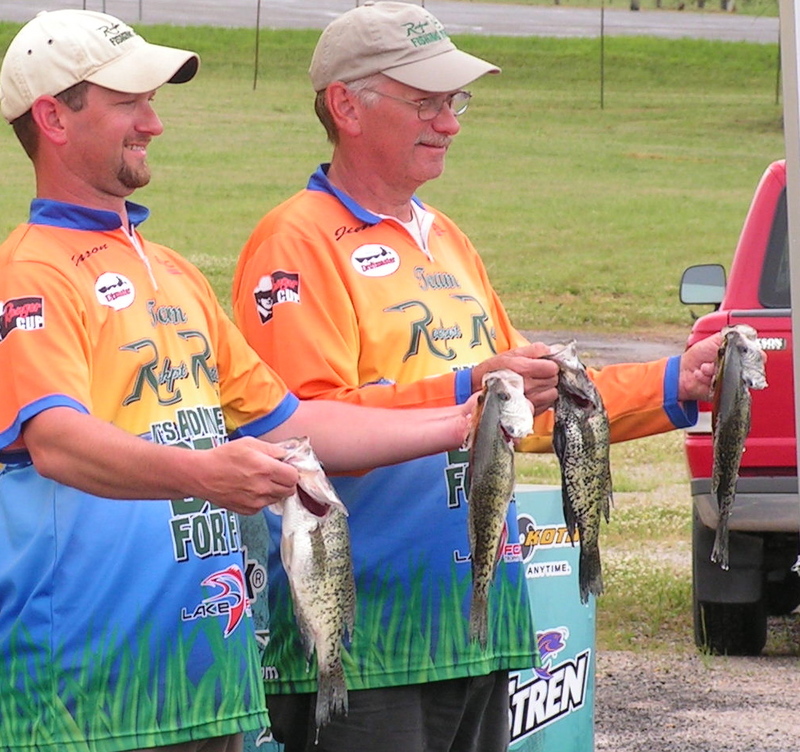 * The third place team of Josh Gowan and Josh Chipman of Missouri also caught lots of fish, mostly on minnows, but also on small minnow-like plastic jigs rigged without a lead head, but with hooks inserted in them. * Other anglers caught fish on everything from chartreuse Road Runners to Bull Bream/Pearl colored Lake Fork Live Baby shad tails and Crazy Angler Blue Razor Slab Bandits. * To say that Crappie Masters President Mike Vallentine was pleased would be an understatement. He couldn’t say this was his favorite place to ever host a tournament, but by the grin on his face, there aren’t many out there ahead of northeast Louisiana. His wife, Suzette, made the trip with him and stayed at the new D’Arbonne Pointe. She posted a photo of the sunrise coming up over D’Arbonne and said, “I could get used to waking up here every day” on her Facebook page! * Lake Fork Trophy Lures owner and CEO Ronnie Parker, title sponsor of the event, was one of the many fans on hand to see how the tournament went. He is from Emory, Texas. A lot of the anglers caught bunches of fish on his lures. * Most local anglers were fishing just for a chance to win a little money and prove their worth on their favorite lake, but the pros that travel the circuit were going for valuable points to make the CM Classic at the end of the year. * Fishermen from Alabama, Arkansas, Indiana, Kansas, Kentucky, Missouri, Mississippi, North Carolina, South Carolina, Oklahoma, Texas and Tennessee (and of course, Louisiana) fished the tournament. * The economic impact of an event like Crappie Masters on northeast Louisiana is hard to measure, but Crappie Masters has a formula they go by to evaluate what a tournament brings to an area in dollars and cents. According to Crappie Masters, the visits to the lake by anglers prior to the tournament and then actual stays and fishing practice during tournament week accounted for a $635,000 economic impact on the area around Ruston and Farmerville. That includes housing, gasoline, food, fishing supplies and a multitude of things anglers spend money on. In addition to that, it is impossible to judge, but hundreds of other people who hear about the tournament results and see coverage of it are expected to come give the fishing a try. All in all, a big, well-run tournament like this is a big boom to the area and is a big WIN in more ways than one! * And in closing, a good news story: Most fishermen donated their catches, many which went way over the seven fish they could weigh in, to Hunters for Heroes. Donnie Vocker and his volunteers will be busy today fileting fish. But they will go to a really good cause. The Hunters for Heroes group will use the fish to feed their guest veterans at their next outdoor adventure in May. Now that’s a keeper. 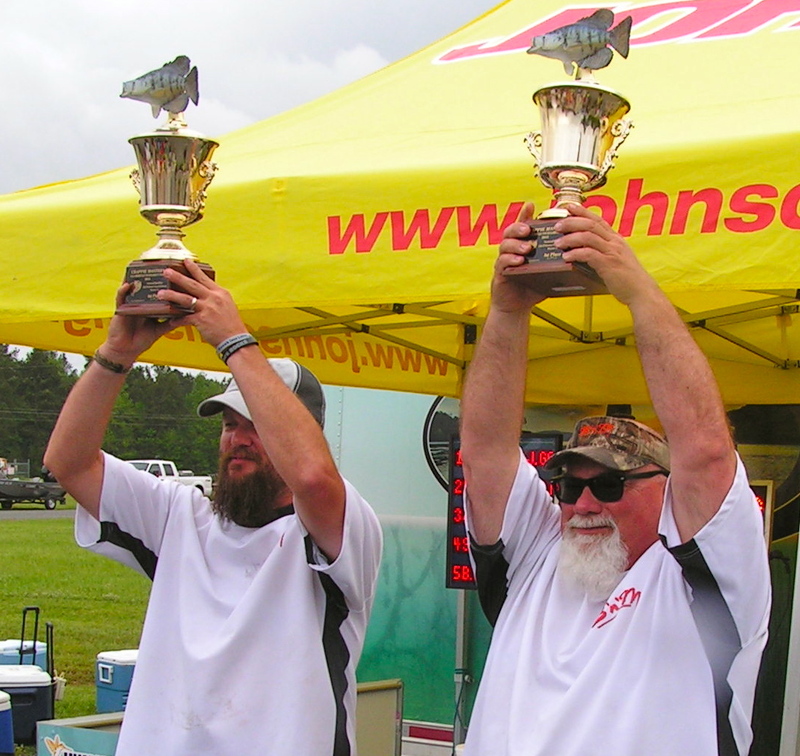 « Stone, Godwin win Crappie Masters!